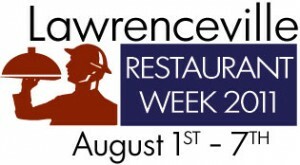 Lawrenceville’s finest dining establishments will welcome diners to Lawrenceville Restaurant Week, August 1-7, 2011. The week-long dining celebration presented by The Pittsburgh TasteBuds will feature both lunch and dinner specials at participating restaurants. As a part of the Pittsburgh Restaurant Week program, Lawrenceville Restaurant Week will showcase the diverse dining options in the Lawrenceville community. The Pittsburgh TasteBuds invite restaurants from throughout Lawrenceville community to participate. Participating restaurants, chefs and menus will be featured on a Restaurant Week Web site, and the week will be heavily promoted throughout the region. For more information, go to www.pittsburghrestaurantweek.com/lawrenceville/. The site will list all of the participating restaurants, featured menus, and reservation information. Stay connected with the Pittsburgh Restaurant Week Program through Facebook or as a Twitter follower. Lawrenceville Restaurant Week is the recipient of a Community Event Microgrant from the Lawrenceville Corporation’s Mainstreets Pittsburgh program, a program of the Urban Redevelopment Authority which is funded in part by the City of Pittsburgh, Mayor Luke Ravenstahl, and the Pennsylvania Department of Community and Economic Development. Next Looking for Pittsburgh’s Best Gyro!